Today's Draw Classic*: Dolphin from the Ocean. Have you seen an "unusual" animal this week, or had an animal that seemed to really stand out to you? Do you feel a certain kinship to a particular kind of animal? Is anything else happening that seems to be significant or trying to give you a message this week? Messages come to us in many forms. Sometimes a message comes in a tarot card. Or maybe you'll hear something in your ear. Or something will happen three times and you'll take notice. Or you'll see something in your mind's eye. Truth is, anything can be a message. And there are those of us that pay attention if an animal comes to us in life, symbol or dream, because it can mean something. This week, I've had two "unusual" animals pop up with significance in my life. One is dolphin, who I saw during a meditation last night and, who, oddly enough, someone wrote to me asking a question about today. And the other is fox, because there's an injured fox in our neighborhood, stirring up the dogs and the worry of neighbors. To be clear, the neighbors are worried about the fox and not for their safety. We have at least one "neighborhood" fox. You don't see them often, because foxes prefer skulking around in the dark. Anyway, this guy is all over the place during the daytime, looking for food and safety. Oh! and a third is rabbit...a big juicy one that I think lives under my shed, but it showed itself to me the other day, which is rare. So we're doing something a little different today and looking at the messages these animals bring. Dolphin is especially relevant to me this week, because dolphins are creatures of the water, but they breathe air like humans. Symbolically speaking, water is about emotions and air is about intellect. So dolphins, to me, represent a balance of emotion and intellect, never letting the other fully take over. But here's the cool thing about dolphins that you may not know...they're not automatic breathers like human. They're known as "voluntary" breathers, meaning they have to remember and intend to come up for air....to come up for the intellect that balances them. The last few days, I've been pretty glum and, with that, my mind has been creating all sorts of imagined tragedies. I do that. I'm dramatic in that way. The good thing about me is that I usually KNOW I do that and can laugh at it. The bad thing is that, when I'm especially down, I forget that I do that and can spiral further down. I caught myself doing that this week and I think that's why dolphin came to me...to remind me to come for air...to come up out of my emotions for a good dose of reason. Now to fox. Foxes are shy and hunt at nighttime, which is why you don't see them that often. As I was writing this, I was reminded of a conversation I had with someone this week about how we're night people and would like to get our schedules back to normal people times. 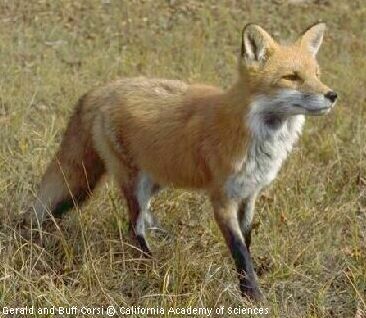 Foxes also ask us to rely on our intellect and instincts. I was thinking about why the fox chose my neighbor's house to hide out at and decided that they don't have a fence, which made it easy. But also I think he instinctively knew the energy was safe there, there were some good cubbies to hide in and he might be able to catch some dinner by surprise. With rabbit (and I hope my rabbit has been able to elude the fox) rabbits are vigilant, quiet and fast. We were right up on that sucker and still didn't see it hiding in the weeds until it made a break for it. And it made its break so fast that I swear Kizzie was confused and didn't even realize what happened. 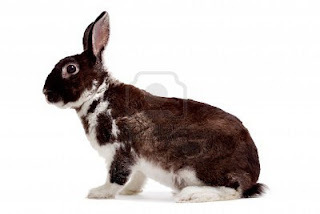 It was a spectacular rabbit, too...tri-colored and even more beautiful than the one pictured. But Magick was standing right there and didn't even seem to see it. Two dogs saw nothing as this rabbit jumped out and hopped the entire length of my yard to safety. Rabbit is that good. He's got a plan. And if he needs to be invisible to his enemies, he can do that, too. 1. 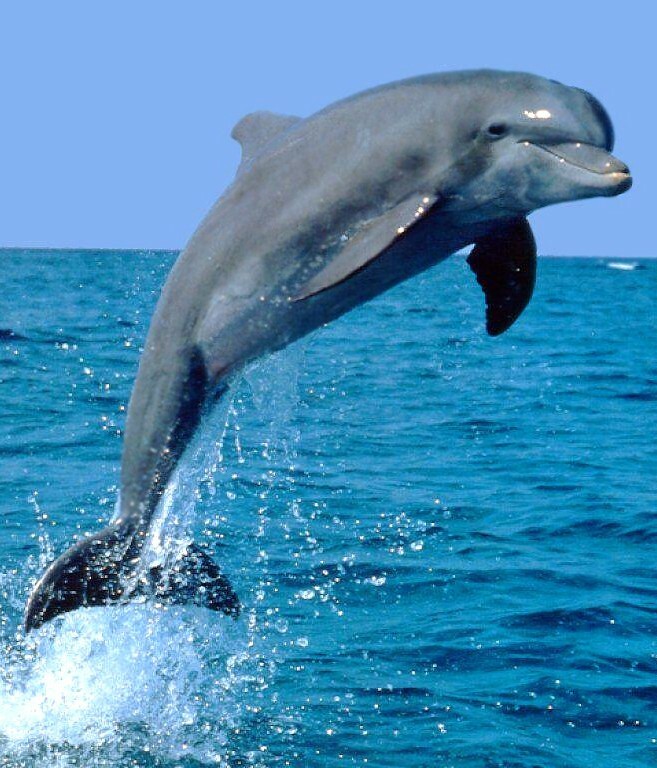 Dolphin asks if the voices in your head that support your doldrums are speaking the truth. Are you just being emotional? Or are all these absolutes—nobody loves me, nobody appreciates me, my work isn't valued, etc.—really true? Chances are, they're not. And another thing about dolphin that shouldn't be forgotten is fun. They like to have fun. And sometimes we need to remind ourselves to do that, too. 2. Fox tells us it's OK to play it safe for a while. If our instincts and intellect are telling us this is not the time to confront our problem from #1 by, say, yelling at our partner and telling them they're poo, then it's probably wise to listen to that voice. Which, by the way, is different from the angry one telling you it's OK to blame them for your feelings. Also, being solitary creatures, they say it's OK to break away and spend time to yourself. 3. Rabbit tells us we need a plan...an escape route...a list of things to do to bring us back to balance. Yesterday we talked about journaling, hot baths, nature walks and a few other things. Tomorrow I'm going to commune with the moon in my special way, as a nod to fox who loves the night, as I do. What animals have been standing out to you in your life recently? To figure out what they might be saying, first ask yourself what you know about that animal and how they are like you. Then google "[animal type] spirit guide" or "[animal type] totem" and see what people online have to say. Everyone interprets things differently, so feel free to really explore what that animal symbolizes to you, even if it's different from what you find online.